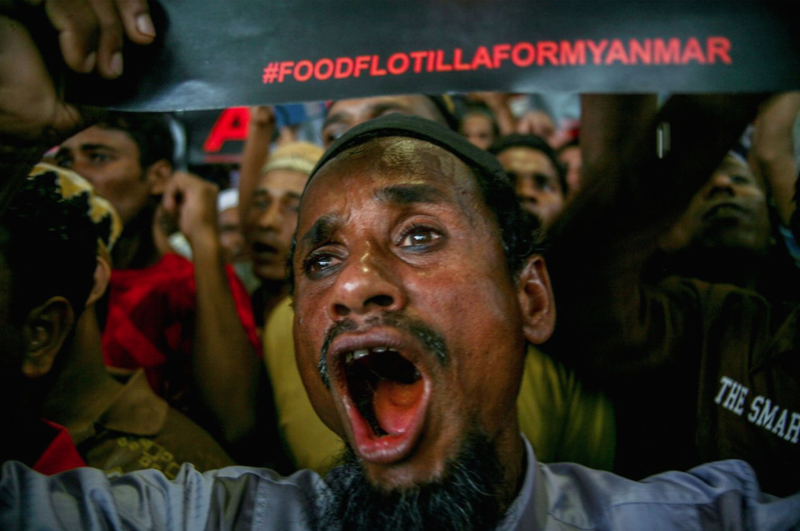 These are Rohingya refugees & human rights activists protesting at the UN offices in Kuala Lumpur, Malaysia against the genocidal military crackdown in Arakan State, Myanmar. Media is repeating the military’s claim that it has killed 30 people in the last 20 days but human rights activists in Arakan State claim several times that have been summarily executed, women have been raped by soldiers, villagers have been evicted & their homes torched, at least 15,000 Rohingya are in flight for their lives. Media also reports that the crackdown is the army’s response to fatal attacks on border police by “jihadists” on October 9th. Maybe some Rohingya organized a paramilitary group armed only with slingshots & knives; maybe they didn’t. Maybe it was 300 Rohingya partisans as is claimed; maybe it was agents provocateurs. The “jihadist” accusation is only a way for the military junta to curry favor in international media for escalating genocide. It’s the all-purpose slander against Muslims who resist oppression. Truth is, Rohingya are sustaining persecution & genocide & they can damn well organize themselves for self-defense by any means necessary. The crackdown is not because of the attacks on border guards but–whoever shot the guards–is being used as a pretext for driving more Rohingya into exile. Rohingya in exile are now calling on the battalions of international solidarity to stand with them. Some commentators claim these are the end-times for Rohingya, that Myanmar’s “final solution” is not far off. Now that the world knows what Myanmar is engaged in against Rohingya, it is our responsibility as brothers & sisters to take up their defense, to demand the end of genocide, to politically protest governments investing in Myanmar. End the genocide against Rohingya. Fullest solidarity with their struggle. Previous PostPrevious PostNext PostWhy is Duterte sending riot police after antiwar protesters!? Doesn’t he agree with them! ?